Dr Ben Heard for Bright New World. become a bright new world supporter today! Sitting in downtown Tokyo, it's easy to forget all about Fukushima prefecture. We must not let that happen. Sitting in comfort with a coffee, and shaded by manicured trees, downtown Tokyo exemplifies our ability to meet our needs in environments shaped to our liking. It’s peaceful, prosperous, clean and safe. The citizens engage in work, leisure and spiritual pursuits, making a fair argument for letting humans be humans, and letting nature be nature. This sense of separateness is an illusion of course, albeit a comfortable one at times. Sinks for resources and production, and sources of waste in multiple forms, our cities shelter us from the harshest natural conditions, but only within a band of tolerance for what the non-human systems throw our way. We are not separate from our fellow humans or the greater world around us. We are part of the same greater system, as natural as the ‘natural’ world, engaged in a ceaseless relationship of stimulus and response. Both our human and non-human realms possess a degree of resilience that continues to surprise, impress and inspire me. We absorb damage, incur loss, and then adjust, adapt, rebound and continue. 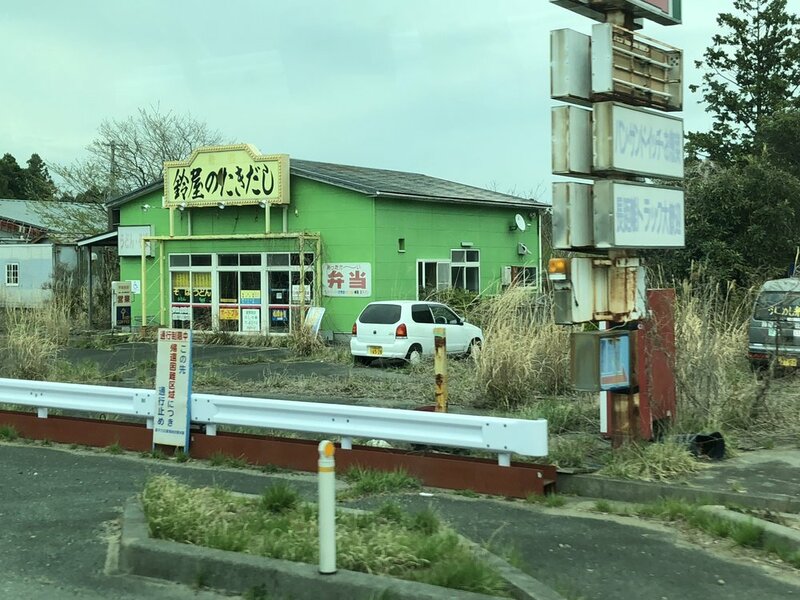 Just a few hundred kilometres from where I sit now, the resilience of both humans and nature is on ample display, as the prefecture of Fukushima continues its journey of recovery from the natural and human-made disaster of 2011. 'Seeing is believing'. Naohiro Masuda, Vice-President, TEPCO. It has been three years since I first made this journey. Much has changed, beginning with the attitude of the nuclear professionals in Tokyo. In 2015 I sensed defensiveness and hurt in an industry still coming to terms with its failure. 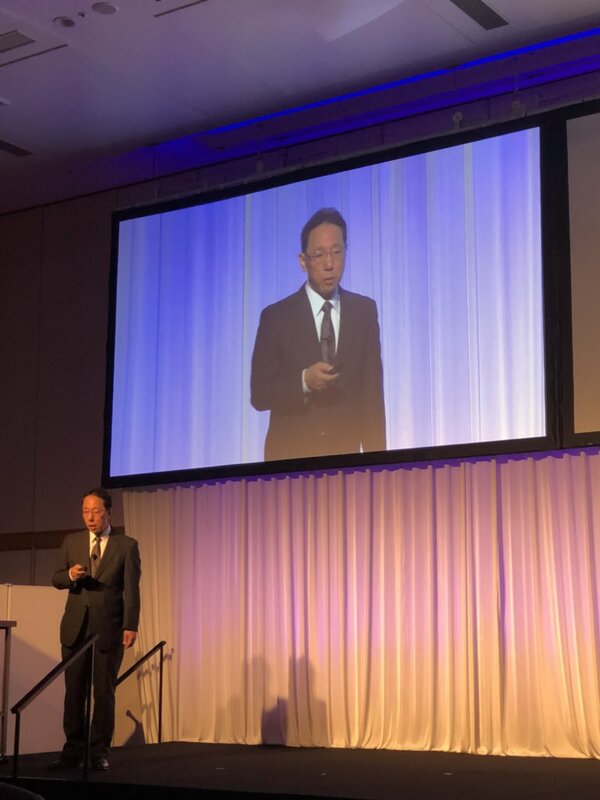 Three years later, at the 51st Annual Conference of the Japanese Atomic Industry Forum (JAIF), I saw evident pride in their progress and how they are managing the challenges at Fukushima Daiichi. There was repeated conviction that they must hear what the community needs to adjust, manage and rebuild – and not just to assume and act. Visitation numbers to the site are soaring - TEPCO now wants the engagement of the outside world. ‘Seeing is believing’ said Naohiro Masuda as he outlined a goal of 20,000 visitors during the year of the upcoming Tokyo Olympics. This was heartening. Such conferences must also hear directly from those affected. We need to hear from young and old, a variety of professions, those returned home, those still in evacuation. The industry must invite and welcome the people to their conference. I can think of few better indications that nuclear culture in Japan has turned an important corner. 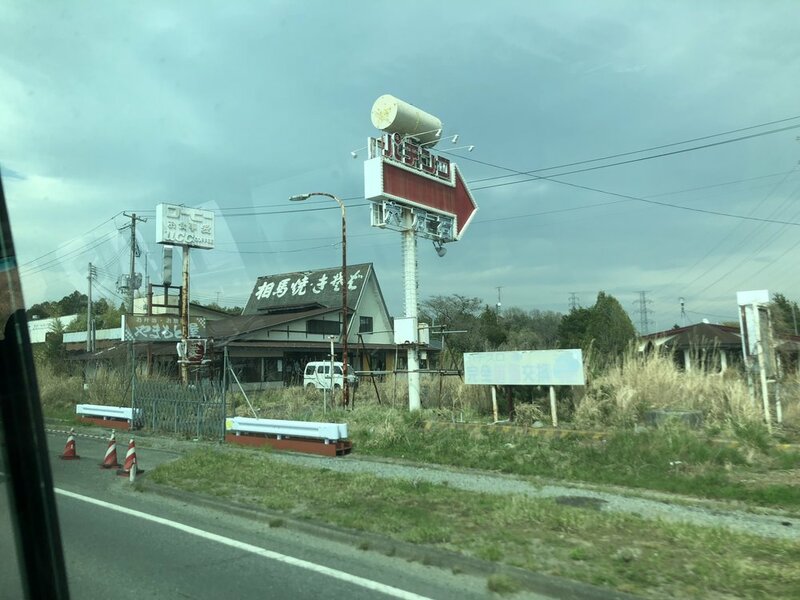 En-route to Fukushima Daiichi itself, tell-tale signs of progress were all around. We breezed right past J-Village, the football training facility that formerly served as the font line induction base. Agricultural lands that were reverting to forest are now returning to food production. Last time, the town of Naraha was the frontier for residential return, at the southern edge of the 20 km exclusion zone. Visionary local officials led the charge for resettlement, calling for the infrastructure to be repaired and the physical (non-radioactive) clean-up. Today Naraha has 7,000 residents, schools, shops and leisure facilities. It has recovered to about half the pre-evacuation population - a massive turn around. The southern frontier now lies just 10 km from the power station in Tomioka, where the evacuation order was lifted approximately one year ago. As in 2015 one cannot simply lift evacuation orders and tell people to ‘go home’. Go home to what? The vital trinity for successful repopulation is reportedly (i) a supermarket, (ii) an elementary school and (iii) a doctor. Radiation is the bogey man that means this region is last to be restored from a devastating earthquake and tsunami that smashed over 200 kilometres of the Japanese coast. 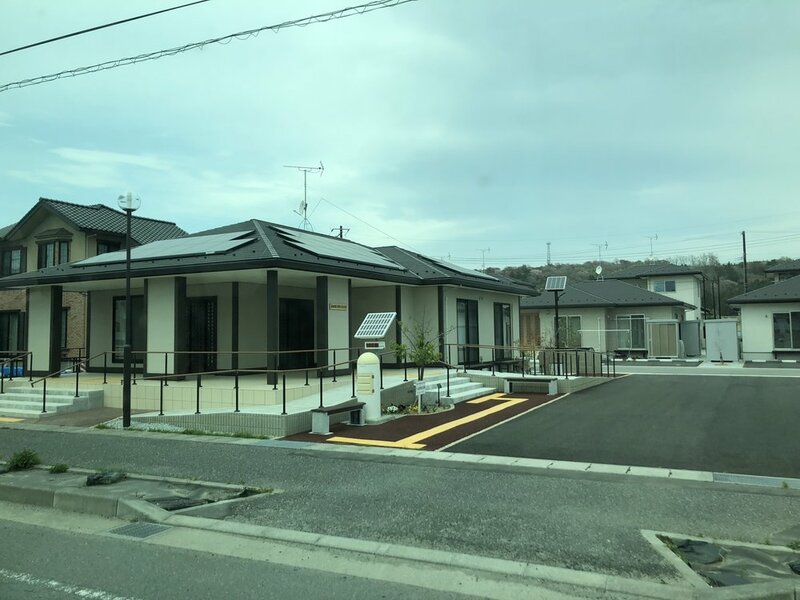 The elementary school in Tomioka only reopened this month. The earliest signs of life nearly escape my attention - a well-kept house with flower beds here; laundry drying the breeze there. A congregation of a couple-of-dozen people had all the appearances of a small wedding. It’s there – the resilience, the pale green shoots of humanity springing from the cracks. Fukushima Corner. At the reception of the JAIF conference, the Japanese nuclear industry promotes the image of Fukushima Prefecture by selling its produce. 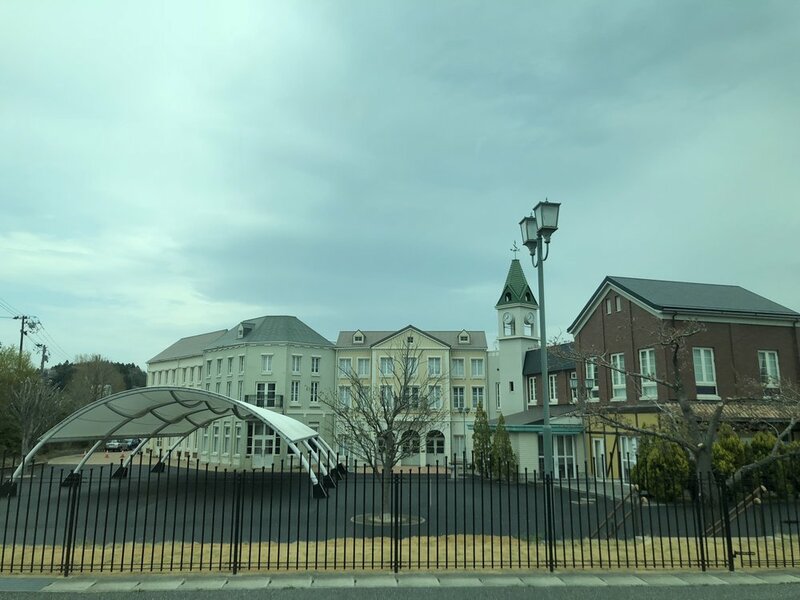 Tomioka has a stock of handsome new houses waiting for people to make them homes, and the train station is now open and undergoing further upgrades. We were brought to the brand new Tomioka Hotel, which stands proudly near the station, waiting for guests. 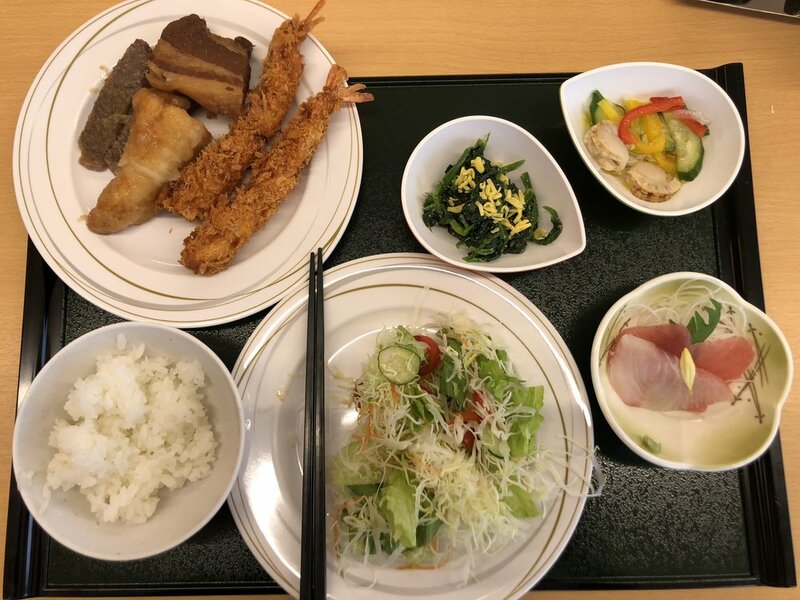 Here, we enjoyed a local lunch of Fukushima produce – rice, vegetables, meats and fish. As in 2015 the smearing of the name ‘Fukushima’, a province far greater than a nuclear power station, hampers the recovery effort. This is changing, and slowly Fukushima is winning, assisted by a nuclear industry that promotes Fukushima produce at every opportunity. But the culpability spreads far and wide, from a global industry of ‘radiation protection’ that positions nuclear technology as uniquely deadly, to NGOs that poison the minds of people at every possible turn to further their ideological war. On this April day, the next dozen outsiders ate the fruits of Fukushima’s production. This one did so with gratitude. Enjoying a delicious lunch of Fukushima produce in Tomioka. This looks like a local school. But no one is there yet. Beyond Tomioka the towns still lie in ruin, overrun by a resilient natural world that laughs-off the minor change in conditions that sent humanity fleeing. Our dosimeters along this route told us we were in an area of about 2 micro-sieverts per hour. A forested hill near the road, that had evidently collected some deposition of material, gave a reading of 5 microsieverts per hour. In 2015 we took a reading at this same location of 10 microsieverts per hour. Sitting on this hill, out-of-doors, for one full year would now result in a dose of 43 milli-sieverts. That’s well within the amount of background radiation that can be found in nature in many different locations around the world. Yet the likes of Greenpeace flog a narrative that this region is ruined. They and others weaponise our fear and deploy it in a war against our second-largest source of zero-carbon energy. Tags like ‘humanitarian’ or ‘environmental’ defy credibility as Greenpeace asks us to buy into a dystopian story of a ‘highly complex radiological emergency’ instead of telling us about a region on the road to recovery. The biggest surprises lay at the Fukushima Daiichi site itself. Arrival is now to a newly constructed and landscaped building, within which lies an atrium drenched in natural light. 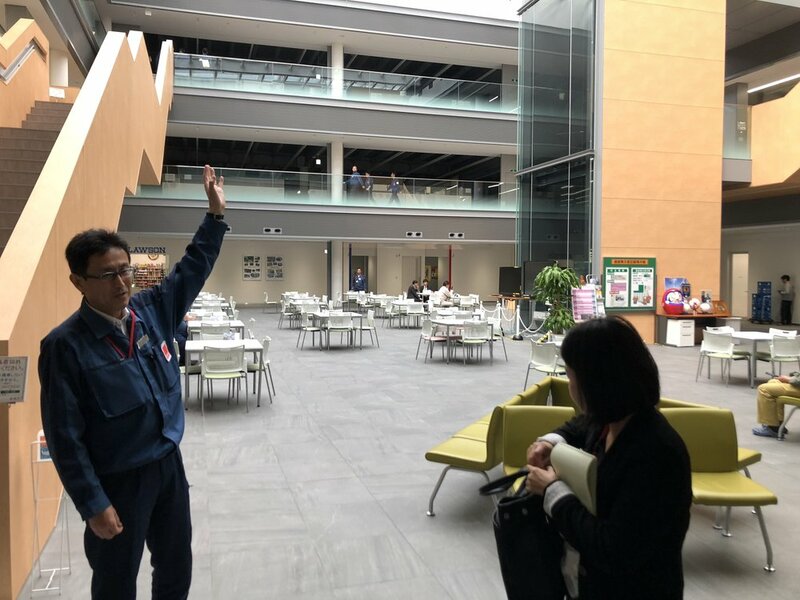 TEPCO professionals take meetings and plan action while a nearby cafeteria, stocked with Fukushima produce, feeds a daily workforce of 6,000 people. Induction is much simplified, with simple cotton gloves and a dosimeter – gone are the face-masks-and-booties of 2015. Much of the site has now been covered with an asphalt. This lowers the dose rates to levels that allow freer access under occupational guidelines, and minimises groundwater incursion to the damaged reactors. TEPCO’s management of water on this site has much-stabilised since 2015. Wells are pumped for groundwater to be withdrawn, treated, tested and released to the ocean without ever entering the reactor buildings. A wall of frozen earth now also reduces groundwater ingress. TEPCO removes excess water from the reactors and passes it through multi-phase treatment, which effectively removes all contaminants save tritium, an isotope of hydrogen which readily forms water. As in 2015 this tritiated water is accumulating on site in massive tanks, though the rate of accumulation has slowed thanks to the interventions described above. TEPCO recently organised a competitive rely race for staff and invited outside competitors too. The new main building is delightful, full of natural light. Looks like a good workplace. Our guide from TEPCO on this day was really thorough and answered all questions. These electric, self-driving mini-buses will help to boost visitation to Fukushima Daiichi. One eye is painted blank and a wish is made. The eye will be painted at the end of the year. The wish from TEPCO was for safety. With Edward Kee of Nuclear Economics Consulting Group. The process has simplified. No booties. No face masks - on the Fukushima Daiichi site itself. Be very sceptical of the ‘contamination theatre’ of anti-nuclear activists. Our TEPCO guide was frank about the future of that on-site storage. They acknowledge the common practice that tritiated water can be safely diluted into ocean (for more discussion on tritiated water, please see my post from 2015). They acknowledge that there is no solution that does not ultimately require environmental release. They also acknowledge that they are bound by a sociological process of consent with local stakeholders. The nascent recovery of the Fukushima brand for food and produce is front of mind, and must not be disrupted by any hasty push for a solution. For now, they manage the water on site, engage with the interested stakeholders, and appear satisfied with that. The relative stability of the groundwater management allows TEPCO to focus on the larger challenges ahead: retrieving used fuel, retrieving damaged fuel, and the reactor decommissioning. In this, no one should underestimate the difficulties. Units 1-3 all have melted, damaged fuel inside the reactor cores and the primary containment. At reactor unit 1, which experienced an explosion of hydrogen gas within the reactor building, the fuel handling crane remains a mass of twisted and damaged metal perched atop a reactor with a melted core of fuel. It has to be unpicked with care, after firstly mapping the mess with three-dimensional CAD programs to plan a sensible removal. It’s like a high-stakes game of ‘pick-up sticks’. The destroyed crane atop unit one must be carefully dismantled. A work platform is erected alongside Unit 2 to begin planing next stages of decommissioning. A new fuel handling crane, covered by a cylindrical roof, will commence removal of used fuel from Unit 3 this year. They caught me having a moment coming to grips with the scale of the site and the operations. A grubby black line marks the likely top of the tsunami that precipitated the crippling of these power stations. 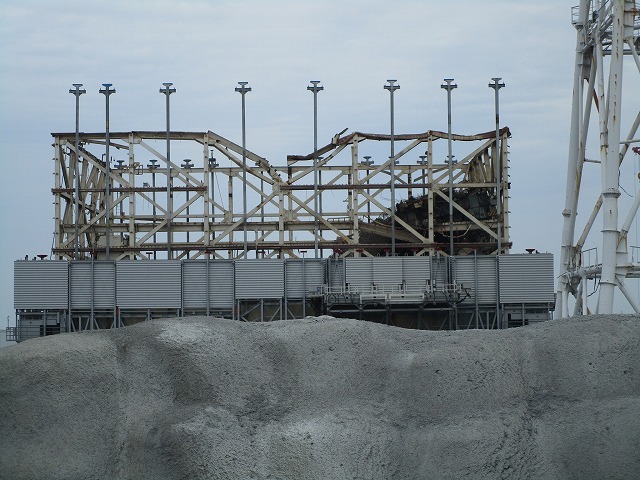 The reactor building of unit 2 remains intact, meaning the interstitial space between it and the reactor itself is highly radioactive (as little of the radionuclides escaped to the environment). Unit 3 has a new fuel handling crane and cover installed to begin the removal of the intact used nuclear fuel, which is due to commence this year. Unit 4, which was not operating at the time of the accident, has an undamaged core and all used fuel has been successfully removed from the pools above the reactor. The impression one now takes from a visit to Fukushima Daiichi is one of cautious, calm planning. TEPCO, so badly wounded by their failures, is resilient and rebounding. As we drove between units 1 and 2, our dosimeter took a peak reading of 290 micro-sieverts per hour. A full year of exposure would deliver a dose of over 2 sieverts. This is not to be taken lightly, however it is localised, and within a hundred meters or so, readings were close to normal again. This is a costly and complex industrial disaster which was entirely avoidable with better planning around this very old technology. It would be utterly implausible to see a comparable accident for a reactor being built today, and actually impossible for the reactors being brought to market in coming years. It is not an environmental disaster like a major oil spill or the failure of the Fundao tailings dam in Brazil. It is not remotely comparable to the recurring and worsening bleaching of the coral of the Great Barrier Reef, the burning of Indonesian forests and peat lands , or the recent acceleration of land-clearing in Australia. For so-called environmental organisations to dedicate any resources to Fukushima at all is arguably an act of outright negligence, a gross misuse of their funds, and an abuse of the sincerely-held values of many of their supporters. Nor is the nuclear accident itself a humanitarian catastrophe. There has been no loss of life from the failure of reactors following the natural disaster that took over 10,000 lives and devastated 200 kilometres of Japanese coast line. Any subsequent loss of life to cancer, based on the highest assumed model of harm, would be so small as to be undetectable. I can only return to the argument I made in 2015: if we want to protect people, we must reform our response to accidents just as urgently as seeking to prevent such accidents from occurring. Thankfully this line of thinking seems to be going mainstream as well as hitting the scientific literature. Unless we learn from our response, one day we will, again, ‘protect’ many people into depression, displacement, ill-health and death. However there is an environmental catastrophe as a result of this accident. Japan today has 30,000 MWe of operable nuclear capacity, sitting idle and generating no zero-carbon electricity. That shuttered fleet is fully half the size of the total amount of nuclear under construction worldwide. That fleet could displace two-thirds of Japan’s coal-fired electricity generation and cut greenhouse gas emissions by 200 million tCO2-e every year. The accident dampened the global appetite for an entire class of zero-carbon generating technology at a time when we desperately need all the clean energy we can get. This trend has been abetted by the Green multinationals, whose actions shout to the world that climate change will be urgent just as soon as they have finished an ideological war on nuclear technologies. They, the likes of Greenpeace and the Australian Conservation Foundation, don’t want us to be strong, resilient, and aspirational in the face of adversity. They want us fearful, angry, small and misinformed. Recovery in Fukushima runs against their preferred narrative, so they act to postpone it whenever and however they can. The dosimeter I was wearing tells me my received dose during my stay was 0.01 milli-sieverts – overall, a lower radiation dose-rate than my flight from Sydney to Tokyo. Leaving the plant, I place a pin in my place of origin on a map of the globe. Some spots are getting crowded, but I am only the second from Adelaide (hmmm…who was number 1?). Overall, it seemed there was no hurry to “fix” the Fukushima site, more an understanding that it had to be done properly. Unfortunately, there seemed little hurry to open the exclusion zone either. I was left with the depressing impression that the area would become sacrificial; that it was just too hard, and it would simply become an area for scientific study. It seems I was wrong, and this time I left Fukushima buoyed by the seed of our resilience – hope. I have every confidence that when I return in a few more years I will find a region further along the road to recovery. We are resilient. It is when the ground stops shaking under our feet, when the waves recede, when the shock subsides, that’s when we find out who we are, what we can do… and who is really on our side. I have assumed 30,722 MWe of operable capacity (April 2018); capacity factor 85 %; creating 229 TWh per year; displacing emissions from supercritical black coal at a rate of 0.86 Mt CO2-e TWh-1; total emissions saved 197 Mt. To say nothing of slashing emissions of harmful particulates, sulphur and oxides of nitrogen, as well as greenhouse gas, air pollution and land conversion at the point of coal mining. Dr Ben Heard represented Bright New World at the 51st Japanese Atomic Energy Forum Conference in Tokyo, Japan. Dr Heard provided a presentation and participated in a panel discussion relating to the role of nuclear technologies in addressing climate change. JAIF paid economy class return airfares Adelaide - Tokyo with Qantas, provided accomodation at the Toshi Centre Hotel (Tokyo) and complimentary participation in the conference. Bright New World charged a fee-for-service for participation in the conference. The visit to Fukushima Daiichi was arraigned by JAIF for conference participants with the assistance of TEPCO. This article is published without any content or editorial input from any parties other than the author.